A welcome phone call comes from Peter Thompson at Ocean Independence to say the sale of the 52m motor yacht Quantum of Solace, a joint listing with his colleague Michael White, closed today with Jurgen Koch at Fraser Yachts acting for the buyer. Built by Benetti in 2001, this superyacht benefitted from several recent upgrades, including new zero speed stabilisers, rebuilt generators and a full soft furniture interior refit. She also has new audio/visual systems throughout and her sundeck had a complete refit including a new deck and Jacuzzi. 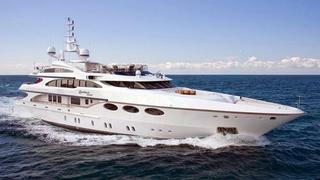 Quantum of Solace can accommodate up to 14 guests in six staterooms and was asking $24.495 million. Jurgen Koch says that, after completing her current charter commitments, she'll be renamed Elysium in late August.